Secnario 1: Rama has destroyed all of Ravana's weapons, chariot etc..and has him completely unarmed. However Rama sends him back to come the next day stating that it is not Dharma to fight an unarmed enemy. Scenario 2: Karna's chariot wheel is stuck to the ground and is unusable. Karna asks Arjuna to hold a bit till the wheel is recovered. Arjuna agrees. Krishna insists that Arjuna kill Karna then and there, and when questioned by Karna as to the Dharma aspect of it, Krishna gives a long discourse on how Karna and his friends had always ignored Dharma and therefore do not deserve to speak on Dharma. Granting that both Rama and Krishna are equally Divine and are therefore infallible to human-like passions etc..and therefore couldn't possibly be party to Adharma, how do we reconcile the above two scenarios ? There are lot of dissimilarities between these 2 scenario, hence we may not be able to reconcile them trivially. Besides, Rama was also involved in the unjust killing of Vali. See: Why did Lord Rama strike from behind to kill Vaali? And also refer, why Karna's life was ended in such situation: Why did Lord Krishna end Karna's life in such a way? At times, to restore Dharma, some of the supreme characters have fiddled with the rules. Karna countered a astra of Arjuna using Varunastra. Arjuna counters Karna’s astra with the Vayavyastra. Arjuna cut off the flag of Karna’s chariot. Then Arjuna took out the anjalika arrow to slay Karna. Arjuna made a speech and then released the arrow at the armed Karna. Karna was not holding his chariot wheel when Arjuna launched his anjalika arrow. Karna had his head cut off. Rama is the one who fights against the wrong thing, here Ravana is completely wrong he kind-napped a wife and hence needs to be punished. Ravana did something which is wrong as per the law and hence is also wrong as per the Dharma. But Krishna is the one who shows that even though whatever the kauravas are doing is right as per the law, but its wrong as per the dharma. They(kauravas) did win the game, but what they were doing was adharma(in justice). So try to understand Krishna sees the intention of the person and not the action and Rama works directly on the action. Both the incidences to show that you should not do wrong things (rama) and to you should not even have a bad intention(krishna). So Rama came when direct injustice is happening and krishna came when injustice was in hidden form. Ravanas intentions was clear from his actions, he did not hide anything, he did what he thought. He thought wrong and did wrong. What karuravas were doing, they were showing we are great person and we are doing everything as per law, so that is why they got this kind of treatment. So its all about intention. Both of these epics collectively shows that your intentions are more important than your actions. Translation :- “On seeing this, Karna again invoked brahmastra against Dhananjaya. He showered down arrows and tried to extricate his chariot. Pandava countered those weapons with his own weapons. Kounteya then released another weapon, beloved of the fire god, towards Karna. It blazed fiercely. Karna pacified the fire through a varuna weapon. He covered all the directions with clouds and it was as dark as a rainy day. Pandaveya was not frightened. While Radheya looked on, the valiant one used the vayavya weapon and dispelled all the clouds. The supreme one’s standard had the marks of an elephant’s housing. It was decorated with gold, pearls, jewels and diamonds. It had been crafted by excellent artisans over a long period of time. It was expensive and beautiful in form. It always inspired your soldiers and terrified and frightened the enemy. It was renowned in the world and blazed like the sun and the moon. Kiriti used a razor-sharp arrow that was gold-tufted and pointed. With that, he brought down the handsome and blazing standard of the great-souled maharatha, Adhiratha’s son. O venerable one! When that standard was uprooted, fame, dharma, victory and everything that was dear to the hearts of the Kurus also fell down. Great sounds of lamentation arose. ‘ “To ensure Karna’s death, Pandava took out an anjalika arrow. It was like the great Indra’s vajra, or like a rod that was made out of fire. It blazed in its rays, like the one with one thousand rays. 800 It was capable of penetrating the inner organs and smearing itself with blood and flesh. It was extremely expensive and was like the fire and the sun. It could destroy men, horses and elephants and was three cubits long, with six tufts. 801 It travelled straight and possessed a great force. In its energy, it was like the vajra of the one with one thousand eyes. It was as difficult to withstand as predatory beasts. It was like the pinaka and Narayana’s chakra. It was fearful and destructive of living beings. 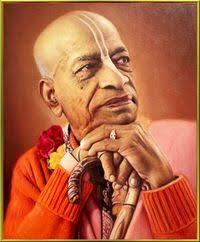 He invoked mantras and affixed that supreme and great weapon to Gandiva. He loudly said, ‘I am grasping this great weapon, which is in the form of an arrow. It is extremely difficult to withstand and is capable of destroying the body. If I have tormented myself through austerities and have satisfied my seniors, if I have listened to what my well-wishers have told me, through that truth, let this arrow slay my armoured enemy, Karna, and bring me victory.’ Having said this, for the sake of Karna’s death, Dhananjaya released that terrible arrow. It was as fierce as rites performed by Atharvan and Angiras. It blazed and was impossible to be endured in a battle, even by Death itself. Kiriti cheerfully said, ‘Let this arrow bring me victory.’ Wishing to slay Karna, bring about his end and convey him to Yama, he released the arrow, which was as radiant as the sun and the moon. Cheerfully, so that he could be conveyed towards victory, the one with the diadem and the garland shot the arrow. It was as radiant as the sun and the moon. He harboured feelings of enmity and wished to slay his enemy. That weapon, blazing like the sun, was shot. Like the sun, it lit up the earth with its radiance. The head of the commander of the army was severed. Like the sun, with a red disc, it seemed to set. The body of the one who performed generous deeds was always reared in happiness. Like a person who is reluctant to leave a house filled with great riches, the head parted from the body with great difficulty. Without the armour, the body was mangled by arrows and lost its life. Karna’s body was severed and fell down. 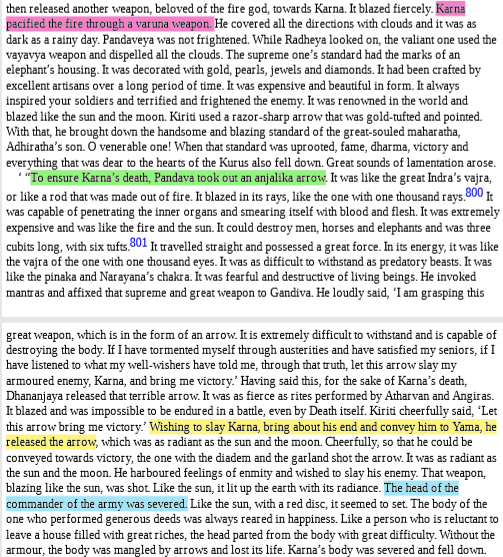 So according to original Mahabharata The last activity done by Karna was to cover the cover the who battlefield using his arrows after shooting Varunastra and furthermore the previous military record of Arjuna also says that Karna wasn't that worthy opponent for Arjuna. Not the answer you're looking for? Browse other questions tagged krishna rama dharma ravana war .